Joshua Simon, MD, EdD, a double-boarded child, adolescent, and adult psychiatrist, renders services in Tucson, Arizona. Prior to entering Michigan State University for medical school, Simon was an assistant professor of exercise physiology at Columbia University where he received his Doctor of Education degree. He’s published articles in scientific journals and most recently has provided continuing medical education for his fellow physicians on emotional intelligence and self-esteem. Simon is married with two children. 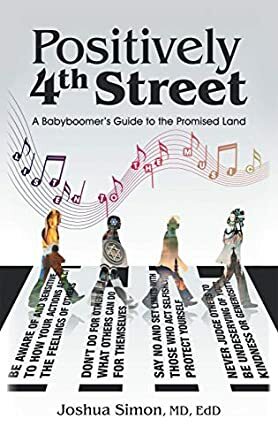 Positively 4th Street: A Baby Boomer’s Guide to the Promised Land is a work of non-fiction penned by author Joshua Simon MD EdD, which focuses on spiritual concepts in the modern age. Written for a particular generation of baby boomers who remember seminal events like the Vietnam War and the music of the rock and roll movement, Joshua Simon's book puts into perspective the basic rules for modern life that mean anyone can still achieve personal and spiritual contentment in an ever-changing world. Through principles of kindness and focusing on others rather than the self, this book suggests that success and feelings of self worth can be achieved. Author Joshua Simon MD EdD presents a neat philosophy in concise terms which makes for really engaging reading. The way the ideas of Positively 4th Street: A Baby Boomer’s Guide to the Promised Land are constructed teaches spirituality and the basic principles of kindness which underpin every major religion, but with a clear nod to the struggles and issues which the modern world can present. I think that even without getting all of the historical references in place for the target age group, any reader would be able to employ the four bases of the Golden Rule to live a better life for themselves and for others. The ways in which the book goes through how to do that and the rewards it brings are very convincing. Overall, I would certainly recommend Joshua Simon’s philosophy as an engaging and affirming read for those looking to make a change in their lives.